I was poking around my library’s eBook website, looking for a few books for an upcoming beach holiday when this cover caught my eye. Thinking back to the Lee Daniels movie/saccharine revisionist history fest The Butler, I was intrigued to learn more about the employees of the White House residence. I’m glad I picked the book up for sure, although I wish it would have been structured a little differently and dealt with the matter of racial dynamics slightly more. The book focuses on the staff members from the Nixon administrations onwards and is organized topically. So there’s a chapter on children and then one on trauma, etc. I was let down by that choice, personally. I didn’t love bouncing back and forth between administrations and re-centering myself into the appropriate time period was not my favorite. I would have liked a more chronological approach. Additionally, the discussion of race was so light touched I was really disappointed. The majority of the people she interviewed were black as are the majority of personal staff in the White House. That’s a thing. A THING, Y’ALL. It’s largely brushed over. So, overall, I’m not 100% sure I’d recommend this one. I may use excerpts from it in a class if I’m ever doing a history unit, but it adds almost nothing substantive about the race conversation beyond the little that the trite Butler movie offered all those years ago. I read this one at the beach and thus had iced tea. Understanding Racism in America: A brief website to start with if my paragraph rant didn’t seem like a big deal to you. “Growing Up White House Style”: Obama’s interview with Bloomberg about the toll his presidency has had on his daughters in terms of freedom and self-development. 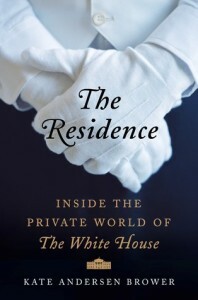 While this book paints a bit of a rosy picture of domestic service, this article from a few years ago explores what life is like for most in that position in the U.S. I got a copy of this book from my local library. Long live libraries!